We're finally able to slow down and take in the situation that our heroine Addison finds herself in 'Tomboy' #3. It's a time for mourning and new revelations. This makes reviewing the issue all the more difficult because I don't want to give away too much but this marks a big turning point for the series. The bulk of the issue involves Grandpa's back story. It's a dense piece of exposition that sheds light on a lot of the questions issues one and two posed while also being totally relevant to Addison's magical yet deadly powers. It also touches on the family's roots in ways I didn't see coming and also helped build-out this world Mia Goodwin has created. The shocking parts are actually from what is said than more of what is seen. Goodwin has mastered the ability to keep readers uneasy with shady characters and layouts that draw you in but keep you off-kilter with a few surprises as you turn the page. Her art is sublime and consistently well paced. Each page leads towards some pay-off whether it's a revelation, an action, or new character. Goodwin has methodically laid out this creepy tale and with the amount of violence we've seen thus far we know anything can happen. The color schemes differ a little between present day and Grandpa's flashbacks, but still in subtle hues. 'Tomboy' is one of the better illustrated books at Action Lab and maybe in comics. Addison takes in a lot of new information this issue. She won't see her Grandpa the same way going forward and now her friend is also in danger. Usually, issues 3 and 4 are make or break for new comics and 'Tomboy' #3 passes the test with flying colors. We get some answers while establishing a new narrative that changes the scope of the series. 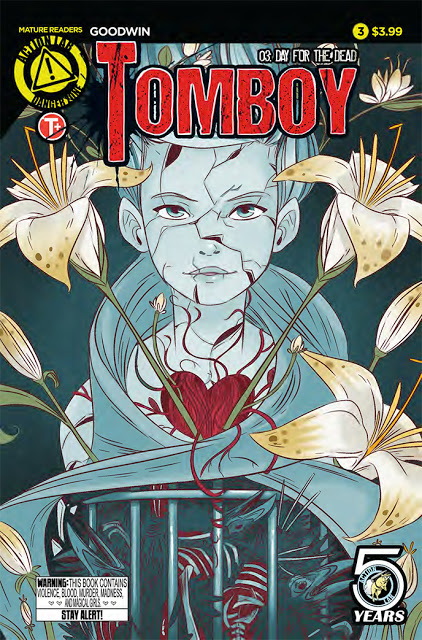 If you haven't added 'Tomboy' to your pull list you're missing out on one of Action Lab's best books.